Do you need a Toddler Carrier? Do you need a toddler carrier? 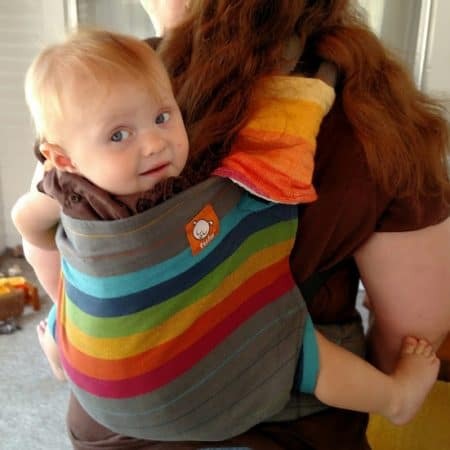 Ever since baby carrier companies started marketing carriers specifically for toddlers, babywearing folks have been trying to figure out whether they should get one, and if so, when. Here are some questions and recommendations to help you make your decision. First of all, do you have a toddler? If you don’t have a toddler, we recommend choosing a standard- or “baby-” sized carrier, so that it will fit your child right now. Don’t “size up” when buying a carrier, planning for your child to “grow into it.” Wearing your child in a carrier that is too big for them could be uncomfortable for you and your child, and possibly unsafe. Despite the name, many of us who fit carriers for families have found that “toddler” carriers are actually more like “little kid” carriers. In fact, many manufacturers recommend children be a minimum of 18 months old before riding in them. Some manufacturers and educators use a guideline that children should wear at least a size 2T in pants before they are placed in a toddler carrier — for some children, waiting until they are in a 3T is even better. So for this article, when we say “toddler,” we will mean a child who is 18 months of age or older AND wearing at least 2T pants AND weighing around 25 lbs or more. If you do have a toddler, let’s move on. Secondly, do you have a carrier already? If you do, and you use it to carry your toddler, congratulations! You already have a toddler carrier. Really! It doesn’t matter what the manufacturer calls the carrier model. It doesn’t matter if it’s a ring sling, wrap, buckle carrier, or any other kind. If it works for you, if it carries your toddler, then you have what you need. These bigger kids are still being carried in “standard” size carriers on the backs of their caregivers. We can see the carrier taking the children’s weight because of how the fabric of the panel conforms to their bodies. The carrier supports most of the child’s back with the children’s bodies in a seated position. 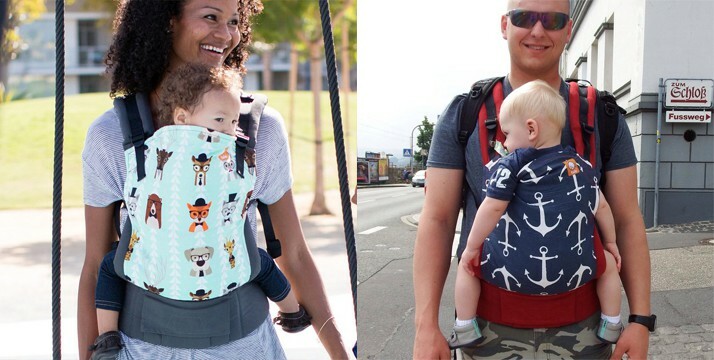 While a bigger (aka “toddler”) carrier might be more comfortable — especially for longer carrying periods — the wearers in these pictures say the carriers are still comfortable and working for them! But what if you don’t have a carrier yet? How do you know if a carrier is too small for your child? What if your friends are saying that a toddler carrier will absolutely change your life? What if your carrier isn’t working for you? Here’s how we like to think about it. 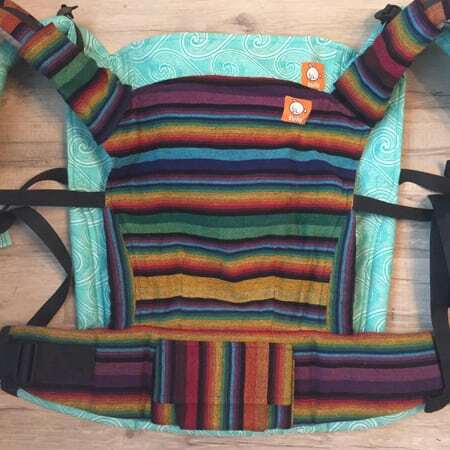 This shows a standard-sized buckle carrier (on top, with the stripes) on top of a toddler-sized carrier (aqua) of the same brand (Tula). The Toddler Tula is *substantially* wider and taller than the Standard Tula. A child who still fits well in a standard size carrier may be too small for a toddler size. The main difference between “regular” and “toddler” buckle carriers is the size of the panel. Taller panels support more of a bigger child’s torso, perhaps even letting them ride with their arms inside the panel. Wider panels support more of a longer-legged child’s thighs, which can let them relax with their knees more at the level of their bottoms rather than hanging down. Having a taller and wider panel can stabilize more of a child against their caregiver’s body, making weight transfer more efficient. A bigger carrier that better supports the child can be more comfortable for the wearer. But it is possible to have a panel that’s too large. How should a buckle carrier fit? A buckle carrier’s panel should be tall enough to support most of the child’s back and short enough to allow the child’s face to be seen from outside the carrier. It should be just wide enough support the child’s legs in a spread squat or “M” position, with the knees at or above the bum, while still allowing the child freedom to swing their legs freely from the knees down. Both of these photos show carriers that are a good fit for the children in them. Each photo shows an adult carrying older babies on their front, facing inward. The carrier panels reach the children’s necks, so we know their backs can be supported, and the children’s knees are completely visible outside the sides of the panels, which are smoothed out, so we know the panels are not too wide. A note about “knee-to-knee”: Some caregivers like to use a carrier with a wider “base,” or bottom edge, so that their child can sit with more support underneath the child’s thighs (the fabric covering the child’s legs “knee to knee”), with the child’s knees at or above their bottoms. Many believe this position is “optimal,” and we do encourage it as more efficient for most caregivers and comfortable for most children. However, we also believe that narrow-based carriers that allows for a child’s legs to hang downward are safe, and we do not have good evidence to prove that they are unsafe. You have been using a carrier successfully, but you have recently noticed more pain or strain in your back or neck than before. Your child’s head and shoulders and much of their thighs extend well out of the panel for the carrier you have. Your child can lean back so far that they’re at risk for falling or they can put you off balance. Your child complains of discomfort or can’t seem to settle in the carrier that was previously comfortable. Your current carrier might still be able to work for you if most of your child’s weight is supported by the panel, and they fall within the manufacturer’s recommended height and weight. This is true especially if your carrier has worked well for you in the past. Just because your child fits into a bigger carrier doesn’t mean they will prefer it! 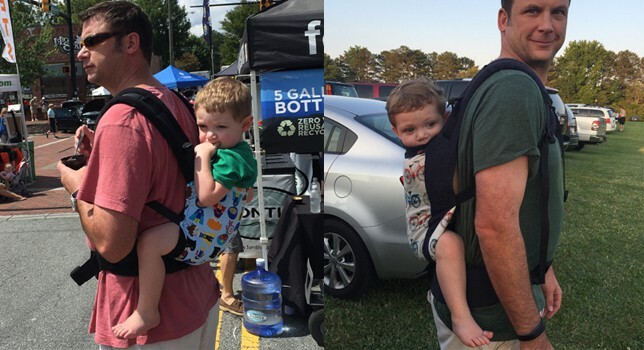 Here are two photos of the same 25-month-old child on his caregiver’s back in a standard-sized carrier (left) and a toddler-sized carrier (right). On the left, we see the carrier worn so the child can hook his arms over the top edge of the panel, and some of the tops of his thighs are visible near the knees. On the right, the carrier panel comes up to his neck and supports his seated position, or straddle, from knee to knee. 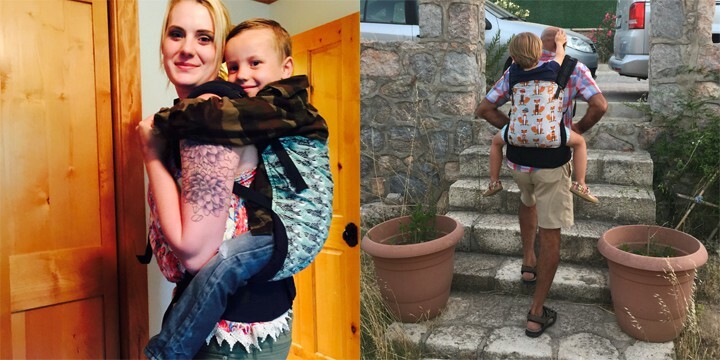 His caregiver reports that the child sometimes prefers the standard-sized carrier because it gives him better views and room to put his arms out over the top of the carrier. Both of these photos show safe and comfortable babywearing. Most of the time, standard carriers can work even for larger children. If you have a carrier that has stopped working for you because of your child’s size and weight, it might be worth checking to see whether there are adjustments you can make in how you use the carrier you have before buying a different one. Changes in your and your child’s bodies could require that you make a change in how you use your carrier to keep it as comfortable for you. Before buying a new carrier, check if any of these common fit issues apply. Do you have part of the panel trapped between your body and the child’s body when you are using the carrier? If so, try resetting your child’s seat in the carrier so that their bottom rests at the base, or bottom edge, of the panel (where it attaches to the waistband). This frees up more of the panel’s height to support your child’s bottom and back. Do you have the shoulder straps adjusted in such a way that they rub into your armpits? If so, try loosening the shoulder straps and using the chest or sternum strap to make the loops of the shoulder straps take a wider route that gives your arms more room to move freely. Does your sternum strap rest near your neck when the child is carried on your front? If so, try moving it downward (you may need to partially or completely remove the carrier to do this, or ask another person for help). Many caregivers find it comfortable to place their straps even with the bottoms of their shoulder blades. You can also play with the tension in the strap to find a sweet spot. Have you have been wearing your carrier waistband above your hips and flat to your body? If your waistband is at a steep angle or tilted or folding away, it may be that you can improve the comfort of your carrier by adjusting where on your body you place the waistband and how tight you make it. Ideally, the padded part of the waistband should overlap your hip bones (aka the iliac crests) at least a little bit, and be snug enough that the belt lies flat to your body once the child’s weight is in the carrier. How to figure out what size carrier to get if I can’t try one on in person? Although many companies recommend that a child be in 2T pants as a minimum size before using their toddler carriers, that is not always an indication you need a toddler carrier for that child. One way to get a better approximation of what carrier will fit your child is to measure the width of your child’s straddle. Straddle width is a term we are (only slightly randomly) choosing to designate as the distance from one knee to the other when a child is in a seated position against your body. Please note that carrier panels often have slight curves and darts and vary from brand to brand, so this is just an estimate. We think it still may be useful. Gather your child and something that allows you to measure a curved distance (this could be a soft tape measure, a piece of string, or ribbon plus a ruler). You may also want to obtain an assistant. Pick up your child and position them on your body as if they were seated in a carrier. We recommend trying this with your child on your front, even if you plan to carry them on your back. Hold one end of the measuring tape or string against your body where the inside of one of your child’s knee comes closest to it. Trace the distance across your stomach with the tape (flush but not tight) until you reach where the inside of the child’s other knee comes close to your body. Check the tape for the length, or hold your place on the string and use the ruler to find the length. That’s your child’s straddle width, for the purposes of this article. Compare that distance to the stated width of the panel for the carrier you’re interested in buying. Choose a carrier with a panel width that is equal to or smaller than your child’s straddle width. If no carrier is narrow enough, you may need an adjustable width carrier or one that uses an infant insert. You have a baby and want to save money by buying a carrier for the child to grow into. The carrier you use should fit your child right now. A carrier that is too big for your child will be uncomfortable for both of you, and may also be unsafe. Most carriers suitable for infants can be worn or adjusted to accommodate much larger children. If your are uncomfortable in the carrier, it may be worth trying out some of the adjustments we have suggested above before giving up! Someone you don’t know told you that toddler carriers were the best and only way to go. We know many babywearers are passionate about the solutions that worked for them, but that doesn’t mean their solution is a good idea for you and that you need a toddler carrier just because they did. Trust yourself and stay open to communications from your child about how they like what’s going on, and we think you’ll be fine. In this photo, a one-year-old looks out over the back of a rainbow carrier with a questioning expression. It may not have been because of the carrier’s poor fit, but it does help us convey that this toddler-sized carrier is not a good match for this child. We can see that the panel of the carrier does not hold his body close to the wearer’s body. Also, the sides of the panel completely cover his knees and prevent his lower legs from dangling freely, even while the fabric is clearly bunching and unable to be smoothly spread out without trapping his legs further. We also see that several inches, perhaps as many as 4 to 8 inches of the panel’s height, are trapped between the caregiver and child, with the waistband worn quite high on the wearer’s body. We would definitely recommend this child be carried in a standard-sized buckle carrier until he grows more.